Dimensions 1.25 by 5.50 by 8.75 in. Authors, American; 20th century; Biography. In the beginning, everything was alive. The smallest objects were endowed with beating hearts . . .
Having recalled his life through the story of his physical self in Winter Journal, internationally acclaimed novelist Paul Auster now remembers the experience of his development from within through the encounters of his interior self with the outer world in Report from the Interior. From his baby's-eye view of the man in the moon, to his childhood worship of the movie cowboy Buster Crabbe, to the composition of his first poem at the age of nine, to his dawning awareness of the injustices of American life, Report from the Interior charts Auster's moral, political, and intellectual journey as he inches his way toward adulthood through the postwar 1950s and into the turbulent 1960s. 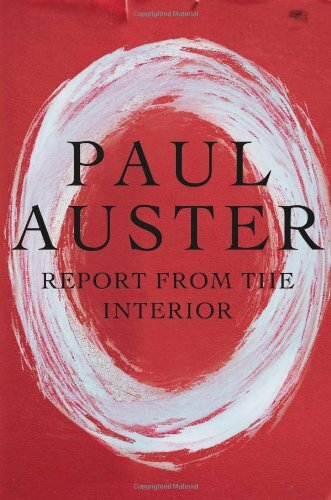 Auster evokes the sounds, smells, and tactile sensations that marked his early lifeÃ¢ÂÂand the many images that came at him, including moving images (he adored cartoons, he was in love with films), until, at its unique climax, the book breaks away from prose into pure imagery: The final section of Report from the Interior recapitulates the first three parts, told in an album of pictures. At once a story of the timesÃ¢ÂÂwhich makes it everyone's storyÃ¢ÂÂand the story of the emerging consciousness of a renowned literary artist, this four-part work answers the challenge of autobiography in ways rarely, if ever, seen before. About: Evoking the sounds, scents and tactile sensations that marked his early life, the bestselling author of Winter Journal, in four parts, recalls his development from within through the encounters of his interior self with the outer world. About: Paul Auster's most intimate autobiographical work to dateIn the beginning, everything was alive. About: IN THE BEGINNING, EVERYTHING WAS ALIVE. About: Evoking the sounds, scents, and tactile sensations that marked his early life, the author, in four parts, recalls his development from within through the encounters of his interior self with the outer world.